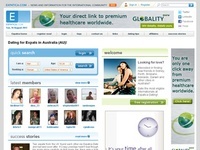 Australia Matchmaker is for Australians and lovers of Australia. Join other like minded singles in the search for love and happiness down under. Aussie Cupid is for Australians and lovers of Australia. Join other like minded singles in the search for love and happiness down under. "Australia & New Zealands premier dating site for 'adults dating'. Established in late 2001, we have had over 40,000 people register with us. With over two thousand new members joining every week, its time you joined and saw what you are missing out on!" 100% free online dating & social networking for Australian singles (and anyone who just loves Aussies). Free photo personals, blogs, forums, videos, chat & more. Join one of Australia's largest singles and dating personal's sites today and start meeting new people! Free to join! Free to search! 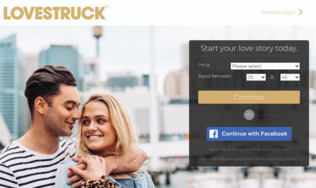 If you are looking for other expats in Australia, this is the dating site for you! Find love among other international singles who have chosen Australia as the place they want to live. Now, aside from living in Sydney, Adelaide, Darwin, Brisbane or some other place within Australia...hopefully you can find love there too. Over 100,000 members from over 150 countries including Australia. Enjoy private chat with other members online. Entire site is available in French or English. "Free For Women". Long distance dating takes on a whole new meaning if you live in Australia, and you consider dating someone who doesn't. Australia is filled with singles looking to meet others online, so why not focus your attention on those who live near you. 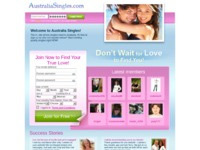 'Australian Singles' is designed specifically for those looking to date other Aussies...in Australia. Dating service for single professionals in Sydney, Australia, offering contact via an online system or via a mobile device. While the site is fully available for free members, they also offer an 'elite' membership which provides additional benefits to paying members.